Researchers have identified a new genetic mutation at the heart of a severe and potentially deadly seizure disorder found in infants and young children. The finding may help scientists unravel the complex biological mechanism behind these diseases. The team states that the current study allows the medical community to fully understand the biological pathways associated with these disorders and why some individuals do not respond to treatment. The opensource study is published in the journal American Journal of Human Genetics. The team explain that epileptic seizures are the result of bursts of electrical activity in the brain caused when groups of neurons fire in an abnormal pattern. The study out today focuses on a severe form of seizure disorders, early myoclonic encephalopathy, Ohtahara syndrome, and infantile spasms, collectively referred to as developmental epilepsies. These seizures appear early in life, in some instances hours after birth, and can be fatal. Individuals with the condition who survive beyond infancy will often struggle for the rest of their lives will developmental disabilities, autism, and uncontrollable seizures. The current study analyzed the genetic profiles of 101 individuals with developmental epilepsy and were able to identify a mutation in a gene called salt-inducible kinase 1 (SIK1), a gene previously unidentified with the disease and one which the researchers believe plays a role in a chain reaction of gene and protein interactions in neurons that contribute to seizures. The team state that high performance computational capabilities were key to this research and enabled the analysis of the full genetic profile, more than 20,000 genes, for each study subject and the simultaneous comparison of the results with data from other families. In the past, this type of analysis would have taken months of computing time to accomplish. The medical community can now get the same results in a matter of days. Once the mutation was identified, the researchers were able to identify the downstream impact of the mutation, namely that it regulated another gene that has been associated with severe seizures called myocyte-specific enhancer factor 2C (MEF2C). While the biological chain of events caused by the mutation is not fully understood, the researchers believe that malfunctioning SIK1 and MEF2C genes interfere with the cellular machinery in neurons that that are responsible for guiding proper development, namely, the growth, maintenance, and maturation of synapses, the connections that allow neurons to communicate with their neighbors. Using an array of experiments, including in brain tissue from an affected individual the team showed that the proteins created by the mutated SIK1 did not behave normally. In healthy cells, the proteins eventually make their way from the cytoplasm into the cell’s nucleus and, once there, help instruct the cell to carry out specific functions. The researchers observed that the proteins created by mutated SIK1 genes remained stuck in the cytoplasm. The team surmise that while the finding sheds light on the biological mechanisms of these diseases, it may also guide treatment in the near future. The primary drug used to treat developmental epilepsy is adrenocorticotropic hormone (ACTH). However, the drug is ineffective in about 40 percent of cases. ACTH is also very expensive and has significant, including life-threatening, side effects. The hormone is known to regulate SIK1 levels. The new finding may enable researchers to better identify which individuals are more likely to benefit from the treatment. EEG and Brain Imaging Data for Individuals with SIK1 Mutations. 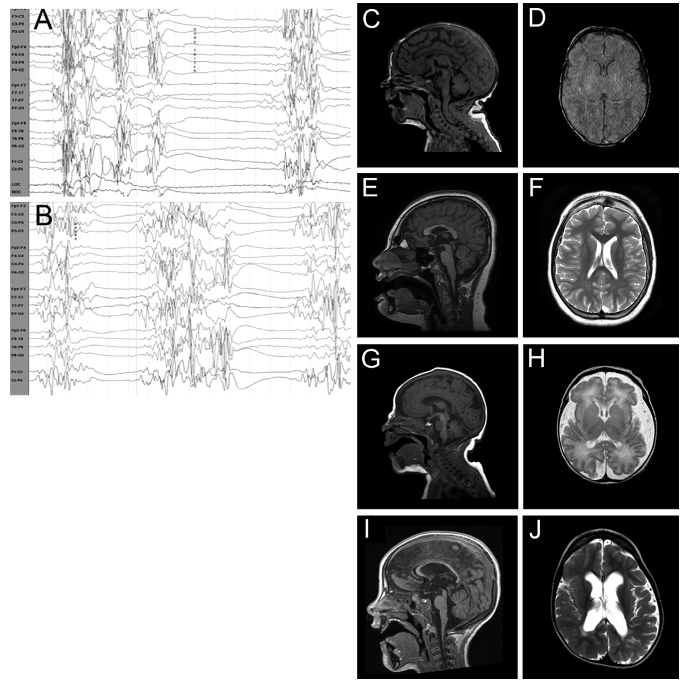 (A) Representative EEG tracings from subject DB13-001 at 10 days of age showing burst suppression pattern with myoclonic activity, consistent with a diagnosis of early myoclonic encephalopathy. (B) At 8 months of age, the EEG had not improved, with continued burst suppression pattern associated with both myoclonic and tonic seizures. (C–J) MRI scans of subjects with SIK1 mutations showed subtle abnormalities. (C and D) Subject DB13-001 (p.Pro287Thr) at age 1 week showed normal morphology. (E and F) Subject IS13-013 (p.Gln614*) at age 12 years showed low forehead, mild shortening of the corpus callosum, and mild atrophy of the cerebellar vermis. (G and H) Subject LR05-086 (p.Gly636Ser) at 3 days of age with increased extra-axial spaces and simplified gyral pattern in the frontal lobes. (I and J) Subject LR05-086 at age 16 months showed thinning of the corpus callosum and asymmetric thinning of the white matter. De Novo Mutations in SIK1 Cause a Spectrum of Developmental Epilepsies. Paciorkowski et al 2015.